You find yourself having to relocate from Montréal to San Francisco, but no sweat. Computers have already identified the things in your home you’ll want to take along. Computers have located and procured replacements near your destination. And what can’t be replaced they will ship there as efficiently as possible. Finally, those items you don’t use, they’ve already posted online for sale. Relax and enjoy your journey! Far-fetched? Not if buildings were able to identify and locate their occupants, including the everyday items worth moving or replacing! This week, the proverbial light bulb just went off (yes, brace for more such puns). Lunera announced the transformation of the LED light bulb. 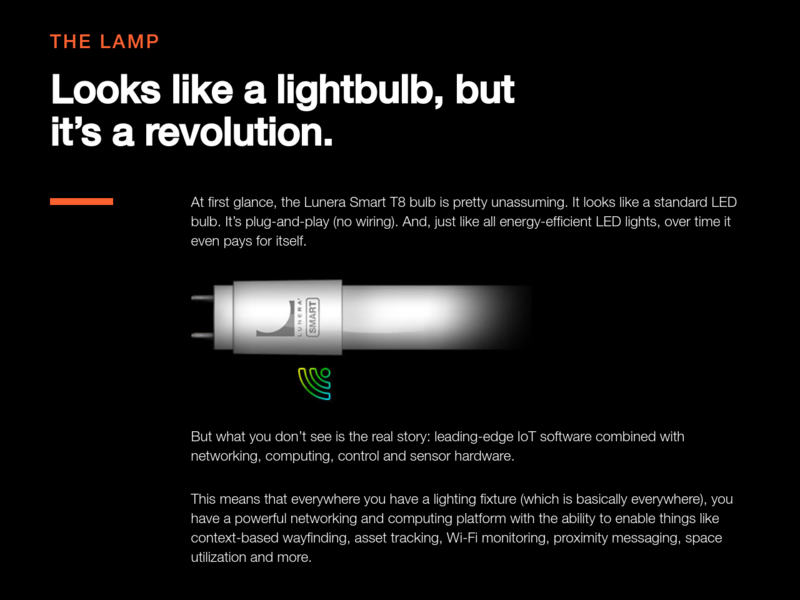 Is theirs the first smart light bulb? No. How then is this transformative? Lunera’s light bulb is the first that’s smart enough to listen. Today there are billions of Bluetooth Low Energy (BLE) devices occupying the buildings in which we live. These include the laptop on which I’m typing, the smartphone in my pocket, the wearable on my wrist and even the chair on which I’m sitting! 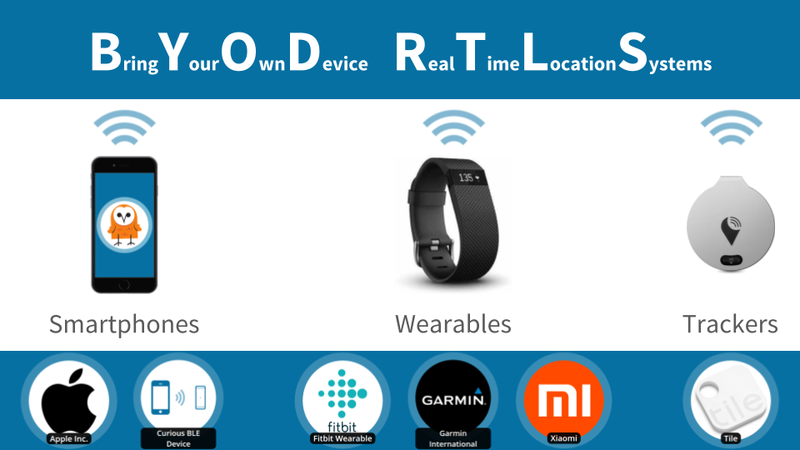 All you need to do is listen, which is what our platform does to identify and locate such devices: effectively BYOD RTLS. Indeed, our own infrastructure has been listening since 2013. We’ve learned a lot since then, patiently waiting for a brilliant solution to the pervasive infrastructure challenge. What’s so exciting today about being a Lunera launch partner is the fact that lighting is the ubiquitous in-building infrastructure. At the flip of a switch, a building can begin to measure the real world like the web. Are BLE and smart lighting not building toward that on an unprecedented scale? Is that not the magic behind our example of the transcontinental move? Is that itself not akin to a Pervasive Sharing Economy? That’s what happens when light hears ahead of its time! While the terms bring your own device (BYOD), coined when employees started bringing their own phones and laptops to the office, and real-time location systems (RTLS), coined when RFID tags started to be tracked, may be unfamiliar to many, together, these concepts promise to have an impact that will soon become familiar to us all in our daily lives. Chances are, you already BYOD when you’re out-of-home (OOH), simply by carrying your iPhone, Fitbit or Tile in public. And, perhaps surprisingly, that very phenomenon is the catalyst for a global sensor infrastructure that is enabling computers to understand the real-world in real-time. Yes, those devices you’re “bringing” can be located in real-time — and in this post we’ll do our best to convince you to be optimistic about the impact! Today, BYOD RTLS is enabling anonymous audience measurement to improve customer experiences. And, the mass production of consumer devices has made radio chips so inexpensive and ubiquitous as to catalyse classic RTLS applications in industry, a cornerstone of the fourth industrial revolution. Before long everything will be radio-identifiable, extending the Uber and AirBnB phenomena to everyday commodities in the pervasive sharing economy. Here’s how and why. When are people passing by? What proportion pass through the door? What are the most common journeys inside my venue? Where do people spend the most time? How much time? What does anonymously mean? At best we can segment by device type, as you can see in the image below and live on our website. Brick-and-mortar retail knows it needs to compete on customer experience, and by answering the above questions — in a way that respects their customers’ individual preferences — the benefits extend right back to those very customers. Where are my assets? Where do they spend the most time? How is work-in-progress moving through my space? Where and when are there bottlenecks? 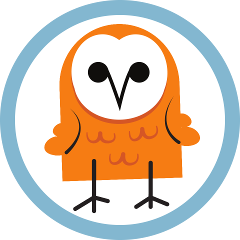 When we founded reelyActive in 2012, we had to develop our own proprietary readers and tags. But merely a year later we were among the first to embrace BYOD RTLS when BLE seemed poised to revolutionise the industry by providing a global radio standard. The ability for any company to answer the above questions is far more valuable than pushing a proprietary platform, and all parties, especially the end-customers, benefit from the resulting massive gain in efficiencies. The fourth industrial revolution is all about efficiency, and industries know they need RTLS to remain competitive. Fortunately it turns out that tracking in-store customer journeys and work-in-progress on a shop floor amount to essentially the same thing — how about that for efficiency! Where is the nearest available bicycle? What tools are available nearby? Who can come and help me right now? Clothing-as-a-Service??? These are the questions that soon we’ll not think twice about asking, expecting not only to receive an answer, but in fact the optimal answer. Already billions of products with an embedded BLE radio are shipping annually, and at least an order of magnitude more are shipping with a standardised UHF passive RFID tag (see RAIN RFID). Before long it will be commonplace for everyday products to be radio-identifiable in everyday situations, driving The Pervasive Sharing Economy where the “Uber for power tools”, the “AirBnB for storage”, and yes, even Clothing-as-a-Service, can finally thrive. Indeed, everything becoming a shareable resource is the embodiment of our vision of ubiquitous machine-contextual-awareness at the service of humanity and is the reason we at reelyActive created open projects such as advlib and Sniffypedia to hasten this revolution. But already today, in the form of anonymous audience measurement and classic industrial applications, BYOD RTLS is making a significant impact which, we hope you’ll agree, has pertinent applications today and enormous positive potential over the long term.